Most of our steel buildings systems can be anchored to either concrete or ground. Some variables can occur such as frost lines, soil conditions, etc. which may change the described method but, as a general rule, these are the ways you would anchor your Alabama steel building or carport. Ground Mount – used instead of a concrete floor. When mounting to the ground its best to dig or augur a post hole about 10" in diameter and 30" deep. This needs to be done at every vertical upright—either every 5’ or 4’ depending upon which frame system you purchased. 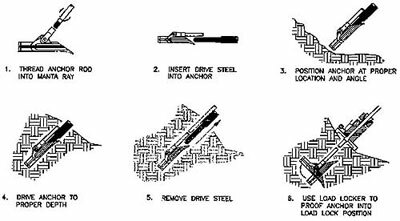 After the base rails are together place them over the holes, affix your ground anchor to the base rail with the remainder of the ground anchor in the augured hole. Fill the hole with concrete. 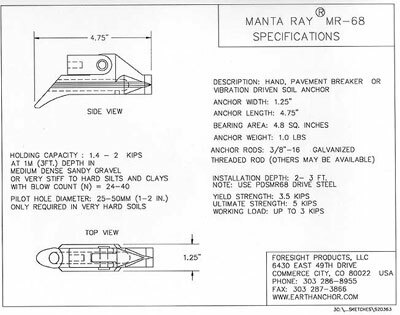 An MR 68 is a ground anchor similar to that used in a mobile home application. The clamps, which expand once they are tightened, are affixed to a 30" piece of allthread. Another rod (pounding rod) is inserted into the clamp and a large sledge or smaller jack hammer is used to lower the MR 68 into the ground. About 6” of the allthread are left exposed. The base rail is then slipped over the 6 inch piece of allthread. A nut is then placed on the allthread and tightened to secure the base rail. This is the simplest method but most engineers don’t like it. The ground anchors are pounded into the ground and affixed to the base rails. Metal building and steel carports have been anchored like this for many years with no problem but it’s a judgment call on your part. If you’re anchoring anything 20’ wide or greater we recommend at least anchoring the four corners with concrete caissons. Then hammer the remaining ground anchors in by themselves and affixing them to the base rails. 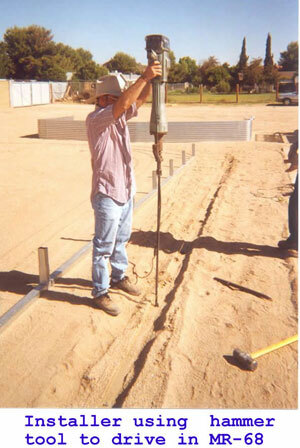 There are two ways to pour slabs and footings which an engineer will approve or recommend. The third method described below has been used for years in Alabama counties and has held up nicely for decades. In all methods, you will be doing what’s called a monolithic pour or monolithic slab in which the slab and the footing are poured at the same time. You’ll need to build the forms for a 4" thick slab using minimum 2800 psi concrete - make it thicker if you’re putting heavy vehicles or RVs on it. The footings will be 12" deep, using the 4"’ of slab as a part of that depth. The footings will have 2 #4 rebar top and bottom (or 1 #5 rebar) in a continuous run around the perimeter of the slab. The slab will have #3 rebar on 24" centers or fibermesh reinforcement added to the mix. If you use the fibermesh, use a concrete mix no less than 4000psi so that when you’re finishing it, the “hairs" of the fibermesh are caught in the concrete cream and don’t stand up like hair on a pig. Below the slab and around the perimeter there will be an 8" deep footer 12" wide. Every 9 feet around the perimeter a hole should be aurured that is 8" in diameter and 24" deep. There is no steel used in this monolithic slab. In counties areas (outside cities and towns)Alabama metal buildings have been anchored for decades in the following way: In the 4" concrete slab put #3 rebar on 24" centers. Around the perimeter of the 4" slab dig a six inch deep "turndown" with your shovel.